On July 18, thirteen enthusiastic paddlers participated in the Invasive Plant Patrol (IPP) PLANT PADDLE, a 3-hour guided exploration in the upper basin of Moose Pond, hosted jointly by Mary Jewett, teacher/naturalist of the Lake Environmental Association, and Roberta Hill, Invasive Species Program Director of the Maine Volunteer Lake Monitoring Program (VLMP). This fun, informal workshop provided an on-shore introduction to plant identification of Maine’s native aquatic plants, detection methods for the invasive aquatic plants that threaten these beautiful and ecologically-important habitats, and the importance of early detection and eradication. After reviewing safety protocols, specimen collection techniques, and demonstration of various scopes to maximize direct observation, participants were divided into survey teams, assigned an approximately 1,000-foot sector of shoreline, and sent out in kayaks to survey littoral or shoreline zones and to collect specimens. Roberta, an aquatic ecologist and environmental educator, has been active in the field of lake protection and community outreach in Maine for over 20 years. Her interest in environmental science with a focus on lake ecology started in 1989 when her family camped near the Middle Basin of Moose Pond. 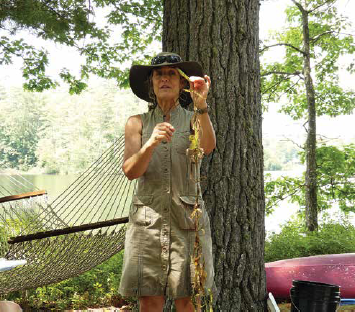 Currently, she is the IPP program originator/coordinator and principal author of the Maine Field Guide to Invasive Aquatic Plants and co-author of Citizens’ Guide to Invasive Aquatic Plant Management. Working in close collaboration with lake associations, conservation groups, and state government officials, the IPP program has now trained roughly 4,000 individuals (including volunteers, professionals, agency personnel, students, teachers, and others) to screen Maine waterbodies for the presence of invasive aquatic plants, and is viewed nationally and internationally as a leading model for citizen-based early detection. Back on shore, Roberta physically sorted each group’s specimens into trays for a plant identification exercise. Participants received a free “Quick Key to Ruling Out Maine’s Eleven Most Unwanted Invasive Aquatic Plants,” and practiced skills needed to spot the good native plants (eg, common or slender water weed) from suspicious plants (eg, hydrilla, variable water milfoil, curly leaf pondweed). Everything else (if your plant does not fit a, b, or c, rule out all 11 most unwanted invaders). According to Roberta, Moose Pond represents one of the cleanest lakes and intact ecosystems in the world and a valuable economic engine for the state of Maine. The Courtesy Boat Inspector program is a huge step in prevention by reminding boaters of harmful aquatic invaders. but the inspectors are not in every location and only a small percentage of lakes have CBIs at their boat landings. As a follow-Fup to the Plant Paddle, Roberta and her colleagues held an IPP Workshop on July 25 at the LEA Maine Lake Science Center. Several of the paddle attendees took part in the all-day event, as did Science Center Research Director Ben Peierls. The presentations by Roberta and VLMP’s Christine Guerette provided an in-depth introduction into the invasive species issue, both in Maine and beyond, with aquatic plants being the primary focus. Through photographs and diagrams, participants learned the fundamentals of native and non-native plant identification. This was followed by hands-on practice with living samples of invasive plants, along with their often similar looking counterparts. The workshop ended with a detailed description of recommended procedures for plant screening surveys. Participants were encouraged to take the steps to become certified IPPers, with the workshop being the first.